Celebrate the last night of 2018 Bow Market-style complete with a Somerville ball drop, DJ, dome, and dance party! Tickets are $20 pre-sale and $25 day-of so get your tickets now! It's that time of year—ready to start gift hunting for friends & fam (and probably find some cool stuff for you)? Join us for a late night of shopping and special offerings in store at Bow Market's retail shops and stick around for drinks and music to close out your night. Sip, shop, explore, get social and get some holiday shopping done early. The temps are dropping but Bow Market ain't stopping! 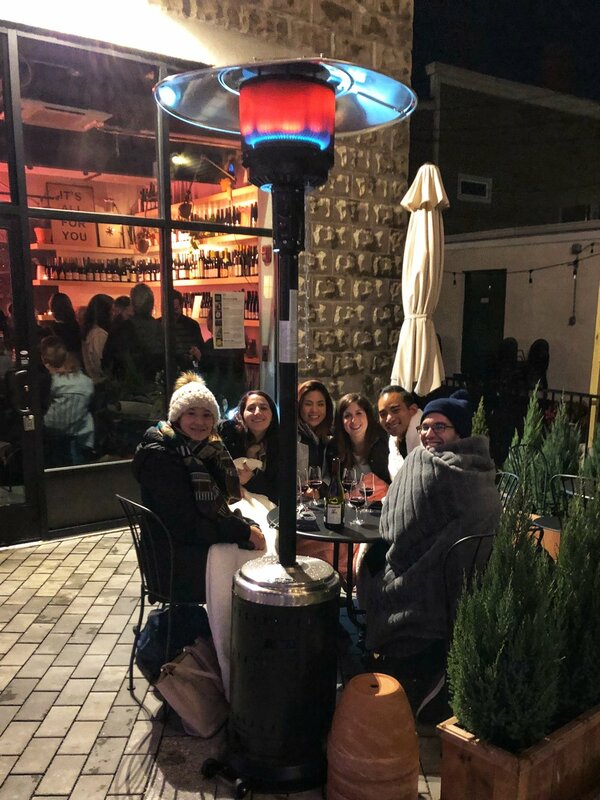 Come get cozy in Somerville's cutest courtyard—snuggle up under some blankets and space heaters with warm-your-bones food specials downstairs, then take your drinks on the road while you get your retail therapy we mean holiday shop on upstairs. Rebel Rebel Somerville: Glögg, a hot mulled wine. Remnant Brewing: Curio Spice Co.-spiced cider + a barrel-aged beer special. Gâté comme des filles: Decadent chocolat chaud w/ cinammon whipped cream. Bow is a stop on the Union Square Main Streets Holiday Stroll. Vote for your favorite vendor window display. Join Bow’s resident shops and 50+ makers for a market-wide Small Business Saturday extravaganza. Come Friday, November 16 at 7:00 pm to EXIT Upstairs. Bow Market's first Art Gallery. For this Opening, Sam Fish (in partnership with Index Vinyl, Rebel Rebel Wine Bar, We Thieves Vintage, and Loyal Art & Design) is positioned to pull you away from your usual Friday night and toss you head first into art-filled, music blasted, vintage styled, wine-fueled party—only at Bow Market. Halloween Hall of Dreams Concert! Bow Market and Make & Mend present Boo Market – a Halloween Treasure Hunt! Bring your kiddos in costume for a series of spooky clues that lead you around Bow Market performing adorable challenges along the way. There is a non-edible Treasure at the end of the Hunt! Buy your tickets here to reserve a Treasure Map and a prize for completing the Hunt. Distilling Evil is releasing their brand new line of mad scientist inspired liquors. The team behind the libations is transforming Bow Market with horror decor like you’ve only sen in your nightmares. Come enjoy the Somerville Art’s Council Somerstreets! Bow Market will be hosting DJ Slum Arts Collective from 1:00 pm - 4:00 pm. Tim's Urban Gardening presents Hydroponic Gardening Introductory Workshop. This 45-minute workshop will cover the basics of hydroponics and the key elements to begin growing fresh herbs and lettuces at home. You'll learn to set up your own hydroponic, countertop herb gardens and small indoor gardens. FREE to the public. Pass-the-hat suggested donation $5-$15. A complete garden kit will be given away to one lucky participant. Union Square Main Streets Fluff Fest spreads it's wings for it's 13th year and is expanding to Bow Market! Find fluff specials from your favorite Bow Market vendors, some terrific musical acts and some extra special fluff excitement! Knot Art at Bow Market! There’s a zombie mob descending on Somerville and we need YOU and YOUR COMMUNITY to help fight the outbreak. First come, first to play for the the first 100 people that register! Buenas is partnering up with vibe experts Vinyl Index to bring you Buenas Noches, a recurring version of the best party we've ever thrown. Join us September 13th at Bow Market (8 p.m. - midnight) for some Miami vibes just because. Your ticket to this jam includes: - a Miami-inspired welcome shot at the Bow Market Bar - a serving of flan - a bocadito - a special treat at Vinyl Index Want more drinks? The Bow Market Bar will be open all night. Hungry? Come get empanadas from us, and if you play your cards right (walk a few feet from the Buenas shop) you can also get your mitts on macarons and pierogi. Want to dance? GOOD. Vinyl Index will be pumping the jams. Need retail therapy? Perfect. Peruse the shops of our awesome retail neighbors, many of which will stay open a bit later especially for this event. Bring your tickets to the bar to check in. You need ID to drink. Have questions? Send them to Melissa at buenasbrand@gmail.com. Come celebrate Ethiopian New Year with Nibble! What a great way to enjoy a weeknight dinner with flavorful Ethiopian stews and a glass of cold beer from Remnant Brewery. Meqdes will be bringing you both vegan- and carnivor- friendly dishes! Come for brunch, pre-game brunch, or get some afternoon snacks with these irresistible Venezuelan noms. Beacon for Spirits in the Courtyard! Come listen to Beacon for Spirits in the courtyard! Celebrate Labor Day at Bow Market! It's BYOP so be sure to Bring Your Own Picnic, we'll keep the coals hot! Come check out Boston Black Owned Businesses and Popella Shop, our newest popups!